The Wiltshire & Swindon History Centre (former County Records Office) at Chippenham houses two collections donated by Westinghouse. The first of these is a set of 11 filing boxes of microfiches containing Sykes drawings. These date from the early years of the 20th century to the 1960s. Although Sykes was absorbed into Westinghouse in 1917 when the founder, William Robert Sykes, died drawings continued to be produced using the Sykes title block. The majority of the drawings cover signalling equipment. Three volunteers have spent the last 18 months listing the details of each drawing onto an Excel spreadsheet. This work is almost complete. The other collection consists of about 14 large boxes each containing between 1,000 and 1,500 index cards for companies supplied by Westinghouse. These are sub-divided into categories of equipment (e.g. rods & joints, signals), with each card listing the drawings supplied or received from the client. Some cards can contain up to 20 entries. Dates of the drawings range from the 1910s to 1960s. The cards also show the relevant Shop Lists (now Parts Lists) associated with each drawing. The majority of the drawings appear to have been scanned and still exist on the Siemens network. The same three volunteers are listing the details of each entry onto an Excel spreadsheet. Two of the boxes have so far been completed and so far about 35,000 lines of data have been entered. This work will continue and is expected to be completed in about 12 months time. As an example of the types of drawing in the collection, here is drawing E6. Even today, at least in Siemens Rail Automation UK, the same numbering is used – a single letter giving the sheet size, then a sequential number. This would have been the sixth drawing at ‘E’ size. Interestingly, although a signalling part, this is a Westinghouse Brakes drawing – note the signature of Mr Edward de M Malan and the 1896 date at the bottom right – as mentioned in ‘A Hundred Years of Speed with Safety’. This was many, many years before the Brake & Signal Company was formed. The downside of this method of numbering is that drawing 1000, for example, may well have nothing to do with drawing 1001, other than they’d have been produced at roughly the same time. This is why the work of the volunteers is so essential. We’ll keep a watch on progress here at www.polunnio.co.uk and let you know when the cataloguing is complete. 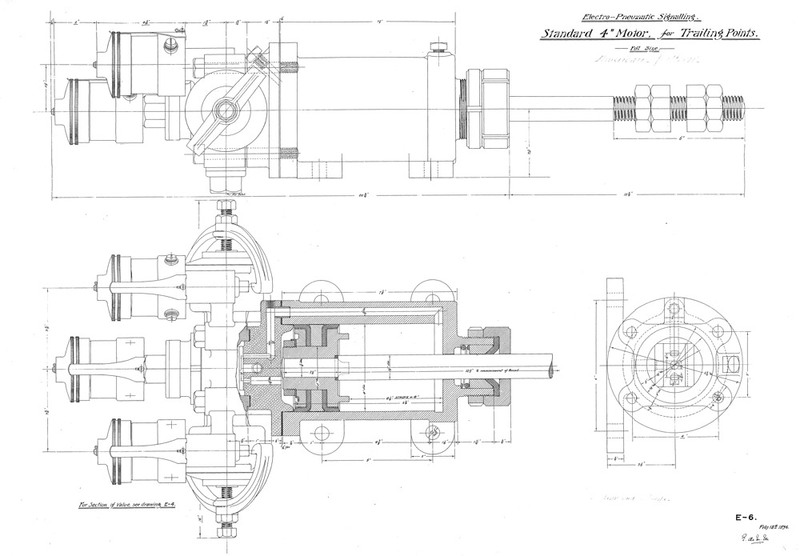 Hopefully this will also be an important step on the road to moving the vast majority of the drawings into the public domain – bearing in mind that Siemens and KB do support some very old equipment as well as the modern high tech systems, and therefore some of the drawings are still commercially valuable! Copyright © 2019 Polunnio Ltd. All rights reserved.